The 4th Annual CASE Hybrid is History! For the last several months, we have been telling you how important it was for you to be a part of the 4th Annual CASE Hybrid Conference, either in Phoenix on site or as a virtual site. As I write this week's article, I am in Phoenix, Arizona, getting ready for the 2nd day of the Winter Hybrid. Today was phenomenal. Long time CASE friend, Julie Weatherly did an amazing job kicking off the conference with a 90 minute legal update. Her handout alone was worth the price of the conference! The next session had Deputy Director of Office of Special Education Programs, Ruth Ryder and Joanne Cashman, director of the IDEAPartnership giving us an historical perspective of RDA and maybe just a little bit of glimpse of where RDA was headed towards. The rest of the day was used to go over the six indicators that could make the most difference in seeing improved student achievement. Arizona attorney, Denise Lowell-Britt shared great advice on LRE, Transition, Dispute Resolution while Julie continued with advice on Discipline, Suspension/expulsion, Parent Involvement and Child Find. 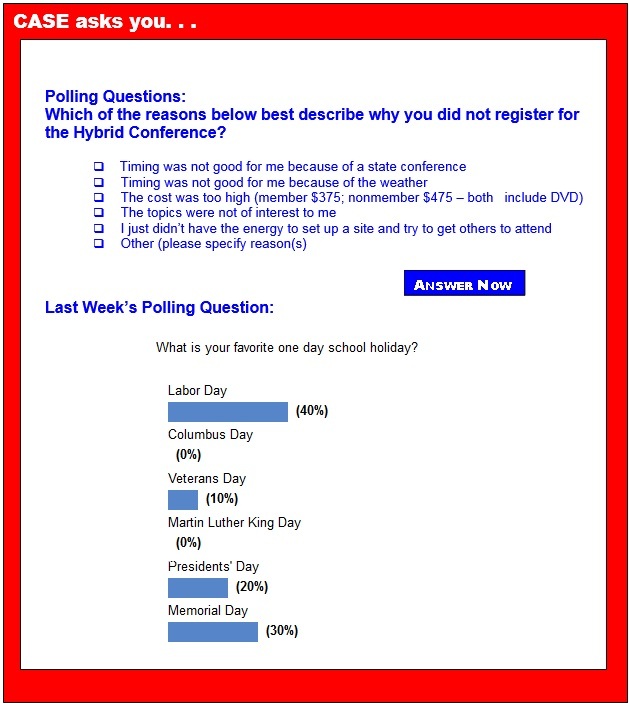 The day was closed out with questions generated from both our virtual sites and our participants on site in Phoenix. The second day of the Hybrid again featured Dr. Joanne Cashman and Ruth Ryder but added Arizona Department of Education's Lisa Yencarelli and William McQueary as well as Debbie Gay, Georgia, DOE Special Education state director, Helene Fallon, Long Island Parent Center, and Laurie VanderPloeg, Kent ISD (Michigan). This panel discussed just what RDA means from the Federal level to the State level to the district level and on down to the school level. As a huge part of the development of SSIPs and the SIMRs, Leading by Convening was also discussed. Specific examples of the Adaptive side and the Technical side of problem solving to improve student achievement were given. If you haven't seen the great resources of the Leading by Convening and the "Collections," you need to check them out! Last week's poll was about your favorite school holiday! Maybe for the first time ever, there were no ties. The number one favorite school holiday was Labor Day at 40 percent. Coming in second was Memorial Day with 30 percent and followed by Presidents' Day with 20 percent and lastly at 10 percent, Veterans Day. There is definitely something to be said about a long weekend! Speaking of voting... Watch your email this week for your ballot to vote for the CASE Secretary. We really want to see a good turn out for our electronic election. It will be simple to do and is always a gage of member engagement. We have two great candidates — both with experience. Julie Bost (NC) is our current secretary and Laural Jackson (AK) is a former secretary. When you receive your ballot, please take a few minutes of your time to read the bios and flyers these two members have put together and make your selection! Voting will only be open for a few weeks so please take your membership in CASE very seriously and vote for one of these candidates! Thank you. In Obama's most recent weekly address, he laid out his plan to ensure that more children will get more access to high-quality preschool and graduate from school fully prepared for their future, college and career-wise. It is evident that elementary and secondary schools are doing better than they have in recent years, and along with this, news reports show that high school graduation rate has hit an all-time high, but with great progress comes even more work and determination to ensure every child receives a quality education. A new report, titled The Economics of Early Childhood Investments, released by the Council of Economic Advisers shows that a strong focus on early learning provides benefits to society of roughly $8.60 for every $1 spent, about half of which comes from increased earnings for children when they grow up. Although inclusive education has made great progress through the years, there are still strong debates over what is the most influential factor that may decrease teachers' resistance to and increase their advocacy of inclusive education. As Congress debates the role of testing, a new report finds that schools with the greatest accountability for students with disabilities are most likely to promote inclusion. Schools held to more stringent academic reporting standards are more likely to deliberately transition kids with disabilities from self-contained to mainstream classrooms, according to the study from the U.S. Department of Education's Institute for Education Sciences. The findings suggest that educators may be more motivated to help students with disabilities achieve alongside their typically-developing peers when schools must account for progress. How can we increase the value of a student's evaluation? An evaluation is only as effective as the questions it aims to answer. And often, evaluators fail to see the precise, critical questions that need answering. They don't know the child or situation well enough to identify them. Therefore, they tend to do what they normally do, often leading to boilerplate evaluations and reports that leave parents and teachers wondering, "What new and valuable answers and recommendations did the evaluator provide?" Schools with a large enough special education population to require reporting on that subgroup's performance were more likely to move students from self-contained to general education classrooms, and those schools also were more likely to offer more professional development and coaching related to the teaching students with disabilities, a survey by a federal center that evaluates education programs found. Under the Elementary and Secondary Education Act, only schools with a certain number of students with disabilities are required to report separately on how those students perform on state tests. The House Education and the Workforce Committee has passed a bill to reauthorize the long-outdated No Child Left Behind Act, despite strong objections from Democratic committee members, the Obama administration and dozens of education advocacy groups. The bill, dubbed the Student Success Act, passed on a party-line vote (21-16). It would significantly scale back the role of the federal government in overseeing public education, give states more flexibility in designing accountability systems and consolidate dozens of federal education programs. The eight-year effort to reauthorize No Child Left Behind, the controversial bill that sets federal education policy, has come down to a battle over testing and accountability among some odd bedfellows. All sides agree that an updated law is an urgent necessity. But the question of what role standardized tests should play and how to hold underperforming schools to account divides deeply. Advancements in mobile application development have given disabled college students more academic independence. While the U.S. Department of Education reported that, in 2009, 88 percent of postsecondary institutions enrolled students with disabilities, the National Center for Special Education Research reported in 2011 that just 19 percent of young adults with disabilities enroll in a four-year college or university. Why is it easy for some people to learn to read, and difficult for others? It's a tough question with a long history. We know that it's not just about raw intelligence, nor is it wholly about repetition and dogged persistence. We also know that there are some conditions that, effort aside, can hold a child back. Socioeconomic status, for instance, has been reliably linked to reading achievement. And, regardless of background, children with lower general verbal ability and those who have difficulty with phonetic processing seem to struggle. But what underlies those differences? How do we learn to translate abstract symbols into meaningful sounds in the first place, and why are some children better at it than others? Many of us would remember our days in primary school sitting in a classroom with four walls, among 20 to 30 other students, and a teacher instructing us from the front. Recently, some schools have been converting classrooms to more open-plan environments, where several classes share the same space. Classes are still divided into classes of 20-30 students with their own teacher, but all of these classes are in the same room with no walls separating them, which results in 50, 90 or even 200 children in the one area. Starting next year, District 86 will be able to educate more of its special education students in its own high school, instead of transporting them to alternative schools. The School Board in January unanimously approved the recommendations of Tammy Prentiss, District 86's assistant superintendent for student services, to dedicate a classroom at Hinsdale South High School for students with disabilities too severe to be educated alongside their non-disabled peers. The federal Individuals with Disabilities Education Improvement Act recommends students with disabilities be educated in the least restrictive environment, in other words with the general population of students, and supported with services, such as physical and speech therapy, social skills training and counseling.